Has a little rack rash, comes with original box. Has a little rack rash, comes in unoriginal box. 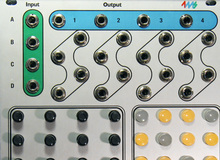 Output module for eurorack. Only used couple of times, perfect condition. Excellent condition. All I/Os and pots work perfectly. Normal rack rash. Includes ribbon cable. Fully functional .. rarely used. Excellent condition (very minor rack rash as seen in photo), incredible build quality. The Music Thing Modular Mikrophonie lets pluck, scrape, tap, and even amplify external signals and process it through your modular.This module is in good shape with just some rack rash. Make noise pressure points.Perfect condition, original user.No rash. A few pots turn a little stiffer than others. Light rash and scuffs. Be sure to check out my other listings! Happy to bundle discount for multiple purchases, message with offers. This module has been in my smoke free studio for around 6 months and has seen moderate use. In very good condition and works perfectly. Comes with power cable/screws/original packaging. ALM S.B.G pedal interface. Light rash. Includes cable for cv-to-expression. Used lovingly and in good condition.